NO BOOKING FEES. BOOK DIRECT & SAVE. Book with confidence at The Club at Sunrise. 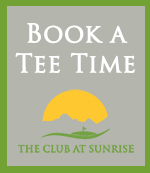 If you find a tee time for our golf course at a lower rate, within 1 hour of the tee time you book, we will match it. Simply show us the lower rate at check in or call the Golf Shop after booking your tee time and we will adjust your rate. As always, no booking fees apply when booking your tee time with us. Make sure you hit the "FINISH" button on the last screen to confirm your tee-time. You should get a confirmation email of your tee-time(s). If not, please call the golf shop. Phone: (702) 207-7501. Note: Rates can be adjusted at check-in based on walking preferences, Clark County residency, and/or member status. Residency status and other rates confirmed at check-in with valid ID/credentials. ADVANCE BOOKINGS: Reservations can be made up to 14 days in advance online or by calling the golf shop at (702) 207-7501. PRE-PAID SPECIALS: Select tee-times are discounted up to 60% off and require pre-payment with credit card at time of booking. Pre-paid web specials are non-refundable. Sorry no rain checks. No further discounts may be applied. Web special pricing is only available with online pre-payment. Starting time for pre-paid rounds may not be changed after payment unless at the discretion of the golf course. CANCELLATION POLICY: Tee times must be cancelled with at least 24-hour notice. This can be done online or by calling the golf shop at (702) 207-7501. A maximum of two tee-times may be reserved per day per player. For more than two teetimes, please contact the golf shop. For any questions about online bookings please contact the golf shop. Thank you for playing The Club at Sunrise in Las Vegas, Nevada.